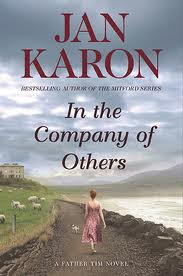 Jan Karon was in Ireland, writing another novel in the 'Father Tim' series. Be sure to visit her website here for more details on her research trip to the Emerald Isle including a slide show. In this novel, In the Company of Others, retired Episcopal priest Tim Kavanagh, is taking his wife Cynthia to the land of his Irish ancestors in County Sligo, Ireland after many years of promising and planning. Although we are drawn into the countryside immediately with its narrow winding roads, torrential rains, beautiful landscape and the smell of turf fires, it becomes clear that this story will take us into the lives of families with secrets, guilt and pain followed by the liberating power of confession, forgiveness and redemption. Father Tim is a listener and he does that well as he draws life stories out of the characters he encounters here, having a gift for reaching out to the hurting. He has come to Ireland to have a clearer understanding of his history, while Cynthia has come for some rest and relaxation. "What would you like to have from this place?" 'Everywhere I have sought rest and not found it, except sitting in a corner by myself with a book.' I want to sleep in tomorrow-sit in that lovely old chair in the corner and read, and listen to the sounds of this place, and speculate." If you are a Jan Karon fan, you may want to take a moment to read the following interview found here. Just reading this interview reminds me of why I love Jan Karon's novels and admire her as a writer. Well, I believe that everything is redeemable. I believe that God uses great, hard things for good. I believe, like a proper Yankee, he doesn’t waste anything. Everything is useful to God and will be made beautiful in the end by God. I think it’s important for us to believe that. He works these miracles all the time, whether we believe or not, simply because he loves us, he created us. And why did he create us? The most extraordinary thing is He created us because He wanted to be with us. He actually—this is really hard to believe, but it’s scriptural—enjoys our company. It’s like if you had a hobby of keeping bees, and you really loved your bees, watched how they performed, and their behavior, and enjoyed the honey. That’s God. He created us for Himself."